The Spring Equinox is here and so are the woodland flowers with violets, wood anemones, primroses, and even the odd early bluebells in bloom. The male which has a dark bill does most of the excavation and preparation before mating. Snowdrops are brightening our part of the Cotswolds as spring continues on the way. They bend over on frosty mornings but soon perk up again as warmer days follow. The Winter Solstice is here and tonight is longest of the year but Spring is coming soon and the Hazel catkins are already out in the woods. There is still some spectacular autumn colour about in the sunny weather as the beech and oak trees hang on to the last of their leaves. 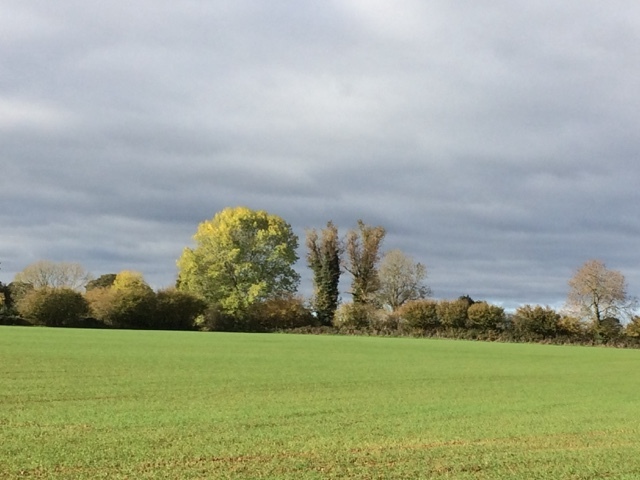 Could be springtime with this bright green tree and planted fields against a stormy sky. 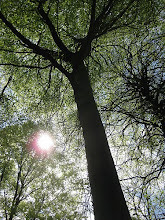 We were walking near Westonbirt in sunshine yesterday but later we drove him me through a snow storm. Spotted this lovely Hornet's Nest in the woods looking like an abstract work of art! The antlers of the fallow deer are now fully developed and most of the soft velvet covering has been shed with a little remaining on this buck. Antlers will be shed at the end of winter and grow again next year. Males are starting to mix with females and sparing with each other in preparation for the rut in September. This herd in Dyrham park are easy to get close to and well worth a visit.